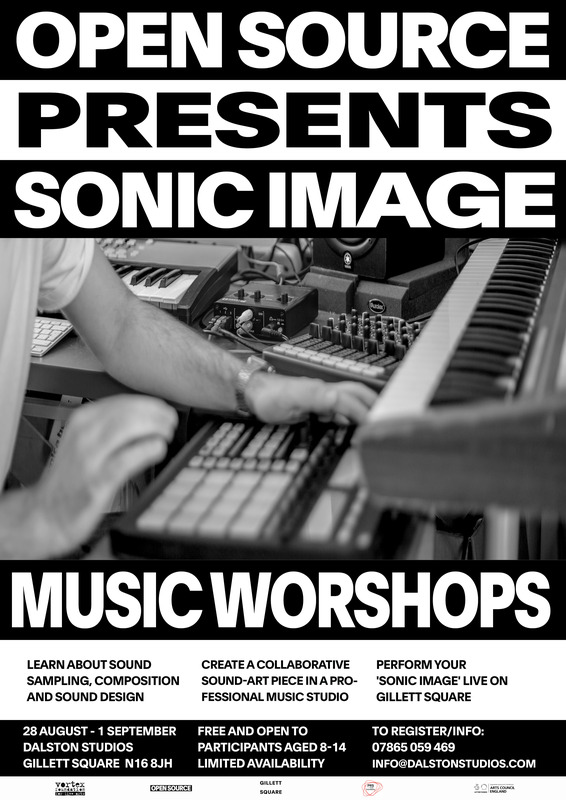 SONIC IMAGE is a summer programme of music workshops. Over the course of a week, participants will explore the possibilities of composition, sampling and sound design. Immersed in a professional music studio environment and assisted by passionate musicians and technicians, participants will have a unique opportunity to craft their own sounds, create cutting-edge samples and build a collaborative music piece. Final compositions will be performed live on Gillett Square in September. These workshops are FREE to attend and registrations are on a first come, first served basis. A deposit of £20 will be held to secure participants’ registration. Deposits will be returned after the workshops upon attendance. SONIC IMAGE is kindly supported by PRS for Music Foundation and Arts Council England. The workshops will be held at Dalston Studios, Unit 7 Stamford Works, Gillett Street, London N16 8JH.